Tanglewood RV Park – Let's Go RVing! Almost four years of RVing and we still feel like Newbies! We seem to learn something new on every trip, sometimes something really big and sometimes just a process that makes things easier. Despite the absolute fun and convenience of traveling on wheels occasionally we have a bit of frustration. Things break or wear out just like they do in our sticks and brick home, thus my post today. On our way to the FMCA Rally in Indianapolis in July we realized that our assistive braking system on the car was not working so while at the rally we talked with a representative from the company. We discovered that the system had been installed incorrectly. Campers Inn had never installed one before so they were learning and we could understand that. The plan was to contact them as soon as we got home to resolve the issue. On to Nappanee, Indiana, home of Newmar to have some work done on our Newmar Canyon Star. In addition to some other smaller issues the rollers on the slide had damaged some of the tiles. We asked about getting them replaced but the cost was prohibitive (ah, say exorbitant to us) so we elected to buy a box of tiles and have it done at home. Perhaps that was our first mistake. When we got home (in early August) we took the coach to Campers Inn in Selma/Smithfield, NC where we had the brake assistive system installed. They had agreed to put down the new tiles in the coach at half the cost plus ascertain the problem with the braking system. They immediately got to work on the tiles. They removed the damaged tiles, opened the box we had purchased from Newmar only to discover that we had the wrong tiles. What? We could see the tiles through the cellophane on the box and they looked like the correct tiles. They were the right color but the distributor had changed the grout line making it impossible to correctly align the them. Of course we called Newmar and learned that the distributer had discontinued those tiles – what? We’ve got bare places on our floor, down to the OSB and no available tiles. What to do? Then began the process of Newmar trying to find some tiles. We held off on taking the car to Campers Inn while we were waiting to receive the tiles so we could get it all done at the same time. Second mistake. We had planned to take the RV on a short trip to Raleigh, NC in September for a horse show but of course that was not possible as it was still at Campers Inn waiting for some tiles. One canceled trip. Finally after several weeks of waiting, phone calls to Newmar, frustration, etc. on September 7 I sent an e-mail to Newmar Customer Service and we finally found out that the guy handling our tile problem was out due to a family emergency (actually two emergencies) – understandable but then we had to start explaining all over again. Finally around the first of October I sent an e-mail to Customer Service stating my dissatisfaction with Newmar and the tile problem. Then began a series of e-mails with Derek who was trying to catch up and do what he could. Thank you Derek. The next step was receiving an e-mail from Ivy in Customer Service apologizing for “this whole ordeal” and telling us that the tiles shipped out that day. After several disappointing days of waiting anxiously for the UPS truck arrived we called Customer Service once again. You won’t believe what we found out. The box of tiles (I use that description lightly) in its journey arrived in Greensboro, NC empty – torn and nothing inside. Excuse me, but did no one notice that tiles were falling out of the box? They contacted Newmar who contacted us. Only three boxes of the tile had been located and one of them was gone forever. Back to the emails again. The parts man who had originally helped us e-mailed us and told us that they had found some more tiles and would be sending them to us. Since it was Friday and we were scheduled to leave for a FMCA chapter rally and then a Kountry Klub (Newmar) Region 5 rally on Tuesday I asked if they could be overnighted. He replied that they were being sent by the distributor but Newmar had OKed them to be sent if the distributor would do that. Shortly afterward we got another e-mail saying that they had found some tiles at Newmar and they were being sent out that day. Thank you. Jerry contacted Campers Inn and an appointment was made to take the car in on Monday at 8:00 for the brake repair and to pick up the RV. Guess we’ll be traveling with no tiles on the majority of the living area of the RV because it is doubtful that the tiles will arrive by Monday morning. I have always taken the sheets off of the bed, washed them immediately upon arriving home and then put them back in the coach. Did I do that the last time? Of course not because we were dealing with the house issue plus we had taken a lot out of the coach to use at home because everything in the house was packed up for the move that didn’t happen. On to the story, we decided on Friday to go to Smithfield, get the sheets and determine what we had left in the RV in July. Off to Smithfield we went (an hour away) and guess what we found. Someone had left the battery disconnect on with perhaps a light on so the battery was dead meaning that we had no steps, no light and no way to put the slides out to get the sheets. Discouragement reared its ugly head. We finally pulled the sheets off, literally climbing in and out of the RV and headed home. Brake assist not fixed, no tiles and a dead battery but you know what? These are just little blips along the way of life. There are so many people that have real problems and ours are just inconveniences. Yes, I have been discouraged at times. 2017 has not been kind to us in many ways but God has not been surprised by any of this. He is still in charge! Praise God! Update – Monday, October 16: Jerry got up early and was at Campers Inn before they even opened. They quickly got to work on the car and Jerry, the RV (finally) and the car were home by lunch. Guess what was in the garage waiting for him when he arrived? You guessed it – a big box of tiles! Obviously Newmar didn’t want a repeat of lost tiles so they had packaged them in a huge box. Jerry immediately called Campers Inn and they said to be there by 8:00 on Tuesday morning and they would put the tiles down. We spent the rest of Monday getting ready to leave and by 7:00 on Tuesday morning Jerry was on the way. I followed in the car about an hour later. The tiles were replaced quickly but they suggested that we wait for at least two hours before picking the coach up giving the tiles time to set. No problem as we were not in a hurry. We walked around Carolina Pottery, the local outlet mall, got some buffet lunch at Pizza Inn and pulled out of Campers Inn a bit after 1:00. The floor looked great! They had asked us not to use the slides for 24 hours but other than that all was good – finally! After a couple of stops along the way we pulled into Tanglewood Park around 6:00. We have stayed at Tanglewood a number of times in the past and although there are some unlevel sites we usually have no problem getting level. When I had called to make the reservation I was given a choice of what site to choose and thinking #10 was on one of the first rows I chose that. #10 is in the corner and most unlevel. We finally had to put the jacks down manually but we got it good enough for the night. Setup was quick and easy since we were not pulling out the front slides. We were able to open both slides in the bedroom and that gave us plenty of room for the night. We were having dinner with David and Jane so not pulling out the front kitchen slide did not cause any inconvenience. It felt so good to be back in the coach with everything in its place. Looking forward to a good fall of camping! It got pretty cold that night but we were snug and warm inside our little home on wheels. Ah…. Kudos to Newmar and Campers Inn for their persistence in helping get our tiles replaced. Circumstances beyond their control contributed to a long delay but eventually all was resolved. Needless to say we’re on a first name basis with both companies! An Uneventful Trip to Clemmons! Saturday, June 10 we headed out for Clemmons and Tanglewood Park. Since we knew that Jane and Emma would be involved in dance recital rehearsal we took our time leaving. Fortunately, this trip was very uneventful unlike our previous trip on Easter week-end! We arrived and got set up fairly quickly. The campground is filled with lots of campers on this pretty week-end but we didn’t have time to visit as we headed out to David and Jane’s as soon as we were set up. It’s so nice to be able to stay at a nice park and be close to their home as well. When Tanglewood was closed for the winter we stayed at Greystone RV Park in Pinnacle, also a nice campground but it’s a good 30 minute or more drive to their house with heavy traffic all of the way so Tanglewood is our campground of choice. In addition to the campground Tanglewood has many other facilities that the campers can use free of charge. There is a nice dog park plus a vegetable/flower market on some Saturday mornings. There are a couple of pools, a lake for pedal boats (that’s not as easy as it looks), horse stables, playgrounds, lots of hiking trails and good places for bike rides as well. One of the highlights of the year is the Festival of Lights beginning the end of November and going through December. The entire park is transformed into a winter wonderland of giant, twinkling snowflakes and whimsical scenes! An event that began in 1992 has now become an annual tradition for many with an average of 250,000 visitors each year. There are now over a million individual lights and with the recent update all of them are LED. The campground is only open during the first few days of the Festival so always check before arriving. 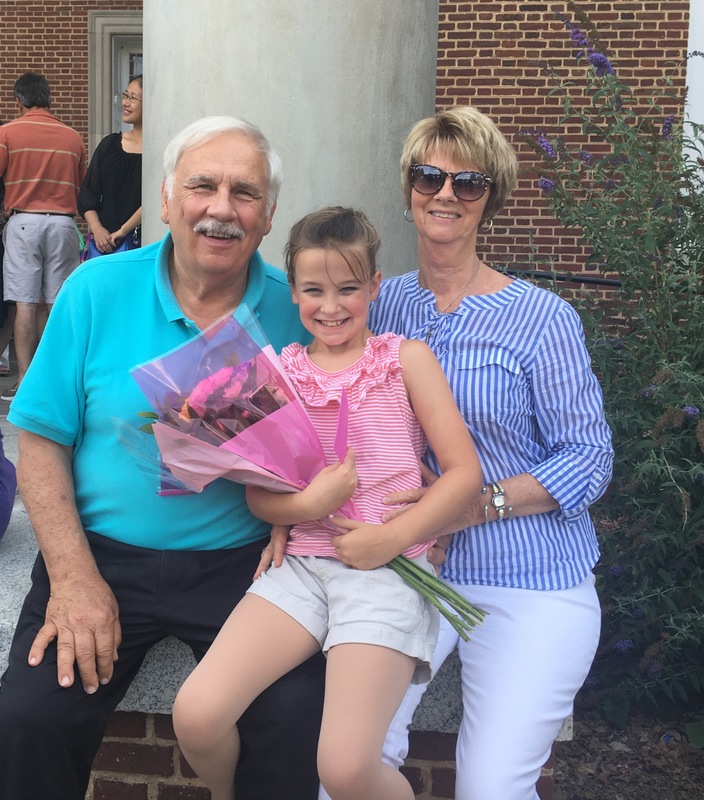 We had a nice week-end visiting with the children and the grands plus seeing Emma perform in her dance recital. After dinner on Sunday evening we returned to Tanglewood fairly early knowing Monday would be a long day. Did we have tire problems before? Since we were not on any schedule and didn’t have a long drive today we just took it slow this morning. Although we were both up around 6:30 we just lolled around until nearly 8:00 and even then we didn’t move too fast! After showers there was still the last minute packing to do plus putting the car on the dolly. We finally pulled out just before 11:00 and we hadn’t even gotten out of the neighborhood before the TPMS started beeping. We drove on for a few miles and then stopped at Mallard’s on 70E where we knew we could easily get in and out plus they had air. One tire was a little slack, the same tire that has given us trouble before. Jerry had taken the coach out to the tire place and they checked it and said that other than a loose stem everything was OK. While the coach was still there we bought a longer stem hoping that would solve the problem. We finally left and headed to Clemmons both of us listening to audio books. It really does make the travel time pass by quickly. I was also cross stitching. Just before we got to South Pointe Mall the TPMS started beeping again. While I ran into the mall on an errand Jerry added some air to the tire. We were there about 45 minutes while I did a bit of shopping, Jerry added some more air to the tire and we ate a wonderful lunch – Cliff bars – and then hit the road again. The TPMS beeped one more time but Jerry said nothing was wrong. While we are in Clemmons he will recalibrate it and see if that helps. We’ve driven about 25,000 miles without a TPMS – guess we were just blessed not to have had an accident. We arrived at Tanglewood just before 4:00 and boy is it crowded. Everyone in Clemmons who can walk, ride a bike or play with a dog is bound to be here. The campground itself is only about half full. We had preselected site 20 because it was close to the router and we were hopeful that the Internet signal would be stronger. Apparently we were more concerned about the Internet than with the slope of the site. Site 20 is really sloped for this part of the country. It took us about 20 minutes to get level and only then by doing it manually. We even considered changing sites but the park is going to be so full that that wasn’t a possibility. We finally did get it level though by Jerry standing outside giving me directions and me adjusting the jacks manually. We’ve tried this before with limited and confusing results but today I hit the right button and it worked! After we set up we went over to David and Jane’s to check on everyone. Jane is really ready to have her baby but Emma is not! There is definitely going to be some adjustment there. I talked to Jane about the possibility of taking Emma to Chattanooga when school is out and she said nothing was scheduled for that time. Hopefully we’ll be able to work it out. Finally! Getting ready to take off on another long awaited trip. Well, truthfully it hasn’t been that long since we were on the road but it surely seems like it. When we returned from Perry, Ga we emptied the coach of nearly everything and then took it to Wilmington, NC to Howard RV where we were assured everything that needed attention would be repaired. After driving four hours each way for earlier repairs (that were not completed) the two hour drive to Wilmington was great. We left our coach on Tuesday afternoon and by noon on Wednesday we had a call discussing every issue that we had discussed! My word, it wasn’t even 24 hours and they were already on it. Quite a difference and my only regret is that I didn’t know about them sooner. It would surely have made the last year easier. We had told them we’d like to have it back by April 15 if possible as we needed to go to Clemmons for the birth of our sixth grandchild! From past experience with another dealer we felt like we might be asking a lot but heck, it doesn’t hurt to ask. We also knew they had to order parts and that does take a while so although we’d be disappointed we were prepared for a longer time. We called to check on the status on Tuesday, April 12 and were told that the person that had that information was out but they would check on it and call us back – and they did! Never under estimate the value of a returned call even if they don’t know the answer to your question. They didn’t know but they let us know that and said they would find out and call us Wednesday morning. They called Wednesday morning, said our rig was ready for pick up so off we went to Wilmington. I had hoped to go early in the day so we could visit Airlee Gardens as they are so beautiful this time of the year but we had to get on the road. We were in and out of there very quickly but while we were there one of the technicians went over a few things with Jerry. Although we’ve been RVing over two years and have had this coach for a year we are still newbies with a lot to learn. The rest of the week has been spent packing, cooking, planning the trip and looking for interesting things to see and good campgrounds to stay at after we leave Clemmons as we are going to knock around the NC mountains for a couple of weeks. I couldn’t find any COE campgrounds in the area where we are going so we will be staying in private campgrounds on this trip but fortunately two of them are Passport. One only takes Passport for one night but the another takes it for all nights. Yea! Sunday morning is the time of departure. Except for a few last minute items everything is packed – I think, so we’ll soon be on our way to Clemmons where we will revel in the arrival of our precious Olivia. We are one blessed family. We already have three granddaughters and two grandsons and now are waiting for another granddaughter and then a grandson in August. I didn’t understand when people would say there’s nothing like a grandchild but now I do and I do relish every second we are able to spend with them.